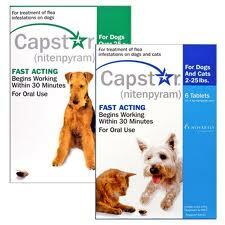 Capstar Flea Treatment Tablets are used for dogs and cats to kill fleas. It starts working within 30 minutes from the application. It usually takes 4 hours and 6 hours on dogs and cats respectively to kill 90% of adult fleas. If the pet is reinfested, it is safe to give another dose as often as once per day. It is better to use it with program tablets (dogs/cats) or program liquid (cats only) to protect from pets future flea infestations. It is advisable only for puppies and kitten at the age of 4 weeks and over, weighing 2 pounds of body weight or greater. It is safe for pregnant and nursing dogs and cats. Works within 30 minutes of application. Capstar contains Nitenpyram which is an insecticide. This Nitenpyram interfere with nerve transmissions in fleas and kills merely all adult fleas quickly with no effects on pets. Pets may start scratching after the death of fleas. It is a temporary condition and may stop quickly. Don’t confuse it as the reaction of medication. CAPSTAR Tablets should be administered according to the following schedule. Weigh your pet prior to administration to ensure proper dosage. Do not administer to pets under 2 pounds.